Table and benches based off of plans on the Shanty2Chic site. Only difference in instructions I used a biscuit jointer instead of pocket holes to assemble the table top itself and I also used a Brad nailer to hold the angle pieces in while the glue dried. 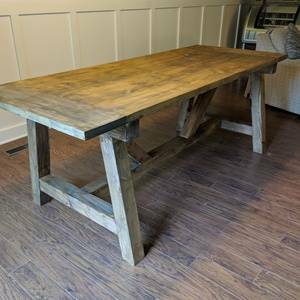 It took basically 2 weekends to do the table the then benches but could have combined those and cut the lumber together to save time. Also the Ryobi belt sander is so important when trying to get the flat smooth table top surface. 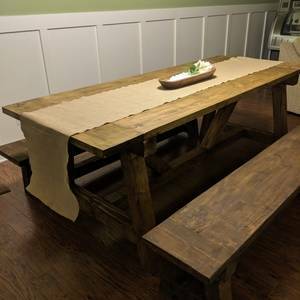 Table and benches based off of plans on the Shanty2Chic site. Only difference in instructions I used a biscuit jointer instead of pocket holes to assemble the table top itself and I also used a Brad nailer to hold the angle pieces in while the glue dried. It took basically 2 weekends to do the table the then benches but could have combined those and cut the lumber together to save time. Also the Ryobi belt sander is so important when trying to get the flat smooth table top surface.